That’s what Memorial Day is… a day to reverently reflect on those who have served and paid the ultimate price for our freedoms. For those who lost a loved one in service, every day is a memorial day. Time does heal, things do get better and life goes on, if you can survive the tragedy. Today, I can look at a flag waving in the breeze without letting a tear drop. I can walk up to military staff in public, shake their hand and tank them for their service fairly easily. 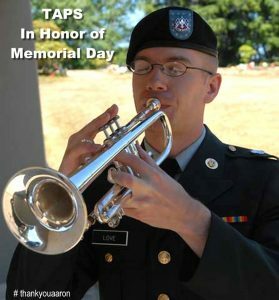 Taps (the haunting single-trumpet or bulge song played at military funerals) will always be a haunting tune for our family. For our family, Memorial Day is a solemn time for remembering Aaron, the people that he served with, the others who gave their lives due to the same sequence of events that led them to answer the call, making the ultimate sacrifice and all other men and women who have served and given all for the greater good. Behind the scenes, this last week, cemeteries along with veterans, boy scouts and other concerned people and organizations have visited the graves of all who have given their lives in service to our country and pre-decorated the gravesides for those who would come to visit. If you’ve never don’t it before, visiting a decorated cemetery on Memorial Day touches your heart in a way that is difficult to explain. We go there to see Aaron, but to see such a high percentage of other gravesites marking those who have shared in Aaron’s heroism is deeply impactful. This weekend friends and family travel to cemeteries all across the United States to pay their respects to those whom we honor this weekend, though there are many who have little regard for the reason behind Memorial Day and focus more on having the long weekend to have fun and frolic – which is, in fact, part of the meaning behind this weekend – for without the price for freedom being paid by others, we would not be able to enjoy the life we live in the USA. 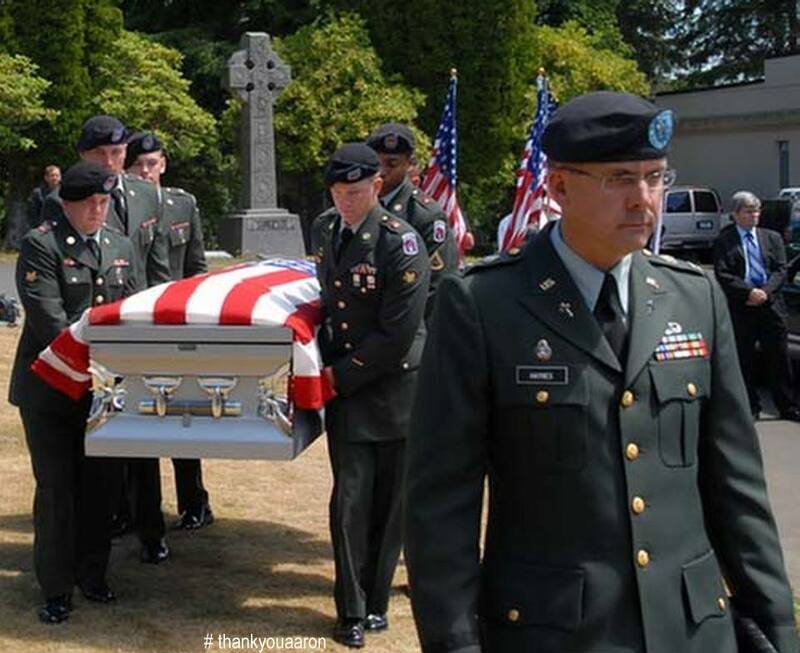 In the morning on Memorial Day, flags will wave at half-mast, just like they did all over the State of Washington in honor of Aaron’s sacrifice; another image that is deeply felt by those who have share the loss of a loved one in military service. In my brother’s town (Washington D.C.) the United States Capitol will be hosting the National Memorial Day Concert to honor the men and women who gave their lives for this country. Taps will be played at Memorial Day flag ceremonies presented by Boy Scouts, Girl Scouts, Veteran’s organizations and other paramilitary organizations around America this weekend in honor of those who have paid the ultimate price. All service people give of themselves, for which we are so grateful; this is a celebration of the lives of the heroes who have given all, making it possible for us to enjoy all this life has to offer. This entry was posted in Aaron, Aaron Fairbairn, Memorial Day and tagged aaron fairbairn, flag, half mast, memorial day, pfc aaron fairbairn, taps on May 28, 2016 by aaronfairbairn.